Suzie Templeton’s beautiful Oscar winning stop action animation (Best Short Film 2008) based on a Prokofiev’s seminal 1936 score of the same name, which in turn is based on a Russian folktale, is made doubly delightful on this occasion, as the Philharmonic Orchestra plays the narrative score live while the film is being shown on a large screen above the stage. In Prokofiev’s musical telling of Peter and the Wolf, the composer’s characters each have their own distinct sound, as both animals and humans are represented by different instruments: bird by a flute, duck by an oboe, cat a clarinet staccato in a low register, grandfather by a bassoon (said to be the least favourite of all instruments), wolf by three French horns, Peter by a string quartet, and the shooting of the hunters by a kettle drum. The idea for the animated film of Peter and the Wolf was originally suggested by Mark Stephenson, Conductor of Philharmonia Orchestra, after Producer Hugh Welchman invited him to see Dog, Suzie Templeton’s first stop action, graduation film, (Royal Academy - 2001) at Southbank Centre. After seeing the Bafta winning Dog, Welchman signed Templeton up to do a project with him, and Stephenson suggested Peter and the Wolf accompanied by Prokofiev’s score. Both Welchman and Templeton agreed, though the idea presented new challenges for the animator as she’d never created work before specifically designed to coincide with a pre-existing form. Templeton began her work with a drawing she’d made of Peter as she envisioned him, which happened rather quickly and never changed from her initial idea of him as an ‘awkward, clumsy, unhappy’ boy, who was potentially, filled with wonder, as you will find out for yourself if you go see this memorable film. Other characters, such as the lovable duck, comical cat and stoic grandfather were suggested by the music itself. Templeton’s wolf is unique among those accompanying this music as she has chosen to create a ‘she-wolf’ instead of the more traditional male, as she felt it would present more ‘complex and interesting’ motivations for the character in relation to animating it. Prokofiev’s beloved music begins once Peter manages to get through a hole in the fence around the humble home outside of the city which he shares with his grandfather, to the forbidden forest beyond, with its frozen lake. He and his friends, the loyal duck and daring bird play happily there, for a time, oblivious to the potential dangers around them, including a hungry wolf. 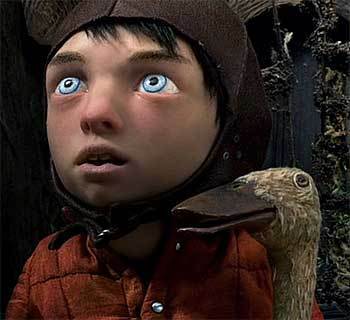 Templeton and her team took five years to make Peter and the Wolf, which at thirty minutes, effectively tells Prokofiev’s story in great detail, with impressive mis en scene and camera angles more akin to traditional cinema than animation, while observing the belief that stop action animation doesn’t seem to work if it’s too ‘real,’ a guideline which allows for fantasy to happily coexist alongside of reason and reality. This apt balance encourages empathy with Templeton’s more sympathetic characters: young Peter, his duck and the bird that visits them. Though the overriding empathy factors in this animation only seem to rival that of 1982 Bafta winner The Snowman, the hand drawn labour of love based on Raymond Brigg’s similarly wordless children’s story. However, given the intermittent jolts ofgritty realism in Peter, viewers are left with the distinct impression that his childhood and, judging by those he encounters on a short trip to the city, that of many other Russian children as well, is far from the idyllic one Briggs’ James enjoyed in the woodsy South Downs. There are many scenes in Peter and the Wolf which surprise, shock and/or delight and several which are virtual tour de forces for animator, Suzie Templeton, i.e. the lovable, oh so vulnerable duck naturalistically ‘skating’ on the frozen lake, a scene which is as oddly touching and it is funny to watch. Like Ray Harryhausen (Jason and the Argonauts, Beast from 20,000 Fathoms, Clash of the Titans) before her, Templeton seems to work on instinct, allowing her characters to develop along their own lines, as it were, creating, via her imagination and skills, fluidity and personalities more akin to human beings than animated characters. The seamless absurdities of Wallace and Grommet are the only other stop action adventures which even come close to hers, though by choice, they lack the realistically dark underbelly of Templeton’s work, the very thing which makes her animations seem so ‘human’, especially in terms of evoking emotional response from their viewers. From the enthusiastic manner in which Mark Stephenson conducts the orchestra during the course of the screening, it is obvious that he has great appreciation not just for Prokofiev’s beautifully expressive score, but also for Templeton’s fine film, which synchs perfectly with the nuances of the variegated music. The wonderful models of Peter, his grandfather – age spots and all, the (she) Wolf and some of the other characters in the film are on display in a glass case near the box office, along with the Oscar statuette won by their animator, Suzie Templeton. Once you’ve seen Peter and the Wolf and been privileged to appreciate it in conjunction with the Philharmonia Orchestra playing Prokofiev’s score live, they’re sure to make the impossible seem more likely than ever.